When the cakewalk came to Paris, it came in two phases: first, in 1900, as a concert of syncopated music by John Philip Sousa and second, in 1902, as a dance performed by the Elks and their troupe. The cakewalk emerged from the African-American experience on plantations during the era of slavery in the United States. There are various stories about the origin of the dance, but the one that is the most widely accepted is based on first-person accounts gathered by researchers of the Federal Writer’s Project who interviewed ex-slaves during the 1930s. The persons interviewed reported that slaves would dance in a manner that mocked the high-class pretensions of plantation owners. Dressed in their most attractive finery, they would compete with each other to see who danced the best. 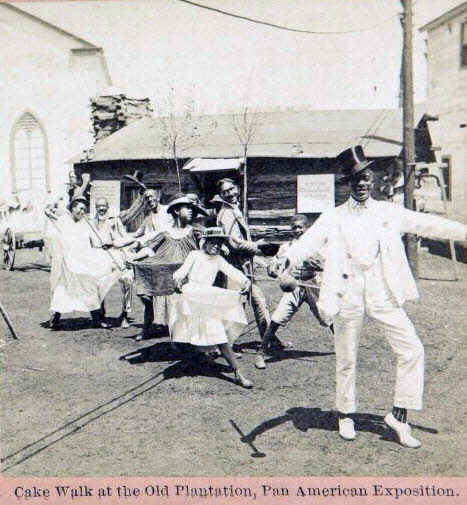 During the era of minstrelsy, white performers in blackface performed the cakewalk. It became a popular form of entertainment for both black and white audiences and was performed not only in minstrel shows, but later in variety shows, vaudeville, circus shows, and musicals. There were several ways to perform the cakewalk: as a graceful walk-around or as a clownish strut; in a group setting with several performers, as couples parading about the stage, or as a solo routine. The performance of vigorous, high-step prancing to lively, upbeat music must have been a thrill to watch. Indeed, the cakewalk has been called a precursor to jazz dance. From 1890 to 1910, a cakewalk dance craze swept the United States and cakewalk contests were organized. An example is the massive contest that was held at Madison Square Garden in 1898. Dancers who won these competitions might get performance bookings all over the world, and the craze spread across the Atlantic. Contests were open to black couples initially, but as the dance trend caught on, white couples would participate as well. 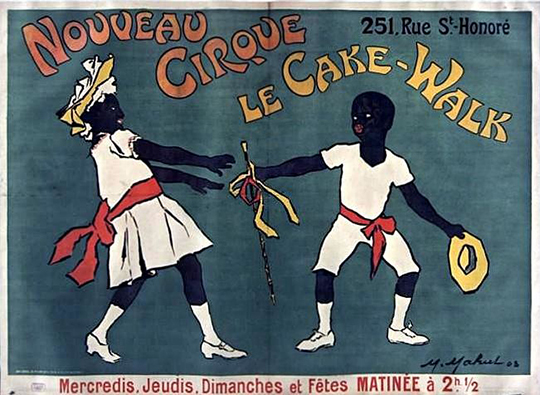 In 1902, Mr. and Mrs Elks, a white couple who billed themselves as “cakewalk champions,” came to Paris and performed at the Nouveau Cirque in a review called “Les Joyeux Nègres” (The Joyous Negroes). They appeared on stage with other cakewalk performers, including two black children, Rudy and Fredy Walker, who have been identified as hailing from Chicago and traveling with their mother, Ella Walker. The first couple to appear in the video is a tall man in drag and his male partner, the second couple is Rudy and Fredy Walker, the third couple is unidentified, and the fourth couple is the Elks. The Elks performance is the most vigorous and at one point Rudy Walker moves away to avoid Mr. Elks’ wildly swinging cane. She can be seen putting her fingers to her mouth to whistle a warning. The fifth couple to perform is Spanish sisters Jeanne and Nina Pérès. Finally, the entire group makes a bouncing, rollicking grande finale. The Elks returned to Paris in 1904 with a new dance, “Le Kickapoo,” featuring Sioux Indians and British chorus girls. The Walker children went on to perform in other European cities, including Vienna (1904), Stockholm (1906), Berlin (1907), and Copenhagen (1908).